Ayurvedic formulations prepared by means of extracts of medicinal plant attained wide appreciation in comparison to crude plant materials due to its convenience and ease of administration. In developing countries, most of the population rely on herbal medicines, considering their affordability, traditional background knowledge and a belief that they are harmless. Many synthetic drugs are known to act on a single molecular target and provide symptomatic relief but drug as a whole and the multi-target responses of Ayurveda drugs are proven to be beneficial in chronic conditions and also in restoring the human health. Although many potential medicinal plants used traditionally have passed the test of time and are likely to produce adverse effects on repeated administration at higher dose; therefore, the safety of the phytochemicals from these plants must come first before its efficacy. There is a strong need to assure the safety of potential herbal formulations to acquire their maximum therapeutic benefits even though proved to be efficacious in pharmacological studies or by clinical evaluations. Metriviv syrup is a proprietary Ayurvedic poly-herbal formulation widely used in clinical practice as uterine tonic for treating many gynecological ailments. It contain many potential drugs, derived from plant sources; therefore, it was thought worth to undertake an oral toxicity study to ascertain safety of compound formulation in the experimental protocol to substantiate the safety claims made on it. Metriviv syrup is a proprietary Ayurvedic poly-herbal formulation supplied by Zoetic Ayurvedics Pvt. Ltd., Ahmedabad. Name of ingredients, Latin name, family, part used and quantity of the drug are given in [Table 1]. For the preparation of Metriviv syrup, herbal ingredients were subjected to preparation of decoctionas per classical reference. Decoction was prepared by taking coarse powder mixture of the drug and distilled water was added; boiled on low-to-medium heat till the liquid portion was reduced to ½ of the original volume and filtered through cloth. Syrup base (66% w/v sucrose in distilled water) was added to the filtrate, mixed well and again heated till desired consistency of syrup was obtained. Charle's Foster albino female rats weighing 200 ± 20 g were divided into six groups each consisting of ten female rats was used for the experiments. The animals were obtained from the animal house attached to IPGT and RA, GAU, Jamnagar, Gujarat. The animals were exposed to 12 h light and 12 h dark cycle with the relative humidity of 50%–70% and the ambient temperature was 22°C ± 03°C. All animals were kept in same environmental conditions. They were fed with Amrut brand rat pellet feed supplied by Pranav Agro Industries, Baroda and drinking water was given ad libitum. The experimental protocols were approved by the Institutional Animal Ethics Committee (IAEC/17/2015/16) in accordance with the guideline formulated by Committee for the Purpose of Control and Supervision on Experiments on Animals, India. The dose of the test formulations was calculated by extrapolating the human dose, that is, 15 ml twice a day to rat dose (1.35 ml/kg, P.O., twice a day) based on the body surface area ratio by referring to the standard table of Paget and Barnes. The test drug was administered orally by oral feeding cannula. Acute oral toxicity study of metriviv syrup was carried out using OECD 425 guideline. Acute toxicity study was conducted using limit dose test of up and down procedure. The female rats were divided into two groups each consisting of five animals. Food, but not water, was withheld for overnight before the experiment and further 2 h after administration of test drug. Metriviv syrup and vehicle as syrup base was administered in a single dose to overnight fasted rats at 2000 mg/kg in sequential manner. Mortality, gross behavior and other parameters were closely observed for 1st 4 h and up to 8 h on 1st day and thereafter every 24 h up to 14 days. The study was carried out as per standard guideline for repeated dose 28-day oral toxicity and modified as per experimental need., Animals were kept for acclimatization for 1 week and thereafter they were randomly divided into six groups each consisting of ten female rats. Group (I) was kept as a control group, received distilled water (5 ml/kg, P.O., twice a day). Group (II) vehicle control group, received syrup base (1.35 ml/kg rat/twice a day orally). Group (III) to (V) were administered with test drug, metriviv syrup at therapeutic equivalent dose TED (1.35 ml/kg, twice a day), TEDx5 (6.75 ml/kg, twice a day) and TEDx10 (13.5 ml/kg, twice a day). The test drug was administered orally to respective groups for 28 consecutive days. The administration period of the drug for the toxicity study was decided from the duration of metriviv syrup in clinical use. Ten animals were kept in the TEDx10 treated group (Group VI) for observation after the treatment period for observation of reversibility or persistence of any toxic effects. The duration of this post-treatment period was fixed as 14 days after main study of 28 days. The rats were carefully observed daily for any overt and apparent sign and symptoms of toxicity during the entire experimental period. Change in body weight of individual rat was noted initially and thereafter weekly during the study period. At the end of experimental periods, blood was withdrawn from the retro-orbital puncture under light ether anesthesia using the capillary tube for estimation of serum biochemical and hematological parameters. The abdomen was opened through midline incision to record the autopsy changes followed by dissecting out the important organs. Hematological analysis was performed using an automatic hematological analyzer (Swelab). The parameters studied were total red blood cell (RBC), hemoglobin (Hb), packed cell volume (PCV), mean corpuscular volume (MCV), mean corpuscular hemoglobin (MCH), mean corpuscular hemoglobin concentration (MCHC), total white blood cell (TWBC), neutrophils percentage, lymphocyte percentage, eosinophils percentage, monocytes percentage, and platelet count. Serum biochemical parameters were estimated using fully automated biochemical random access analyzer (BS-200, Lilac Medicare Pvt. Ltd., Mumbai). The parameters studied were blood sugar, total cholesterol, triglycerides, high-density lipoprotein (HDL)-cholesterol, blood urea, creatinine, serum glutamic pyruvic transaminase (SGPT), serum glutamic oxaloacetic transaminase (SGOT), total protein, albumin, globulin, alkaline phosphatase (ALP), total bilirubin, direct bilirubin, uric acid and calcium. Bone marrow smear from the femur bone was prepared using the standard procedure. All the important internal organs were carefully dissected namely brain, pituitary, liver, heart, thymus, spleen, kidney, lung, stomach, intestine, uterus, ovary, adrenal gland, trachea, aorta, lymph node, and skin. 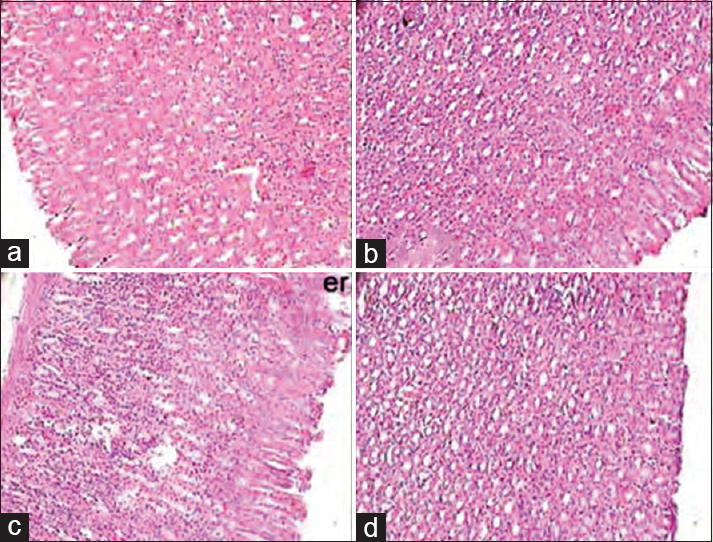 After noting any sign of gross lesion and ponderal changes of major organs, all were transferred to 10% phosphate-buffered formalin solution for fixation and later on subjected to dehydrating, wax embedding, sectioning and staining with hematoxylin and eosin for histological evaluation by light microscopy. The data are expressed as mean ± standard error of mean (SEM) for ten female rats per experimental group. One-way analysis of variance (ANNOVA) was used to compare the mean values of quantitative variables among the groups followed by Dunnet's multiple t-test for unpaired data and Student's t-test for paired data to determine the significant difference between groups at P < 0.05. OECD 425 guideline for oral acute toxicity study was employed using a female to reduce variability and as a means of minimizing the number of animals used. This is because there is little difference in sensitivity in LD50 test between both genders of animals but in those cases where differences were observed, females were generally slightly more sensitive. Metriviv syrup did not show any signs and symptoms of toxicity and mortality at oral dose of 2000 mg/kg in female rats. The Metriviv did not affect any behavioral changes, gross behavior and other observed parameters during entire experimental period of 14 days. This indicates that oral LD50 of the test drug is much higher than 2000 mg/kg dose administered in the present study. As per UN Classification, any substance which has oral LD50 of more than 2000 mg/kg is considered as low hazard potential and categorized as UN 6.1 PG III. Thus, as per the above criterion, Metriviv syrup can be categorized as substances with low health hazard potential (Class 4 of GHS and UN 6.1PGIII). Effect of Metriviv syrup on the percentage change in body weight [Table 2] showed that drug at all dose levels produced significant increase in body weight in comparison to respective initial values. Recovery study produced almost same pattern of body weight gain as observed in other test drugs treated groups and control group. The results suggest that test drug is devoid of any deleterious effect on health status of animals as generally observed by weight gain during the experimental period. On sacrifice, no gross pathological alteration was found in the internal organs during subchronic toxicity study. The macroscopic analysis of the important organs of the animals from test group treated groups did not show any significant changes in color, texture, organ swelling and atrophy/hypertrophy as compared with that of the control group. If result presented in [Table 3] is analyzed, it shows that out of the six organs for which relative weight was recorded, significant decrease was observed only in thymus in comparison to control group. However, there were no any significant changes observed when compared to vehicle control group and no deleterious effect on thymus was seen during histopathological studies, hence, cannot be categorized as serious toxic effect. Analysis of the effect of metriviv syrup on hematological parameters [Table 4] revealed that, all hematological parameters in drug-treated, control and vehicle control groups were within normal range which clearly indicates, Metriviv syrup at high-dose level do not affect both cellular and non-cellular elements of the blood to significant extent. Hence, from the above findings, it is found that Metriviv syrup may not have produced any drastic effects on hematological parameter during 28-day repeated oral toxicity studies in rats. Out of 16 biochemical parameters [Table 5], cholesterol level was nonsignificantly increased in treated groups while test drug at TED and TEDx5 dose levels produced significant increase in triglyceride level in comparison to control group. Test drugs in recovery study produced significant increase in HDL-cholesterol level in comparison to control group. The increase in triglyceride level may be due to high level of carbohydrate content in syrup at high-dose levels. The most of changes are non-significant and not observed in dose-dependent manner. However, the changes are within normal level; hence, these changes cannot be categorized as pathological. Metriviv at all dose levels produced nonsignificant increase in SGPT level in comparison to control group while nonsignificant decrease in comparison to vehicle control group. Test drug at TEDx10 dose levels produced significant increase in SGOT; however, after discontinuation in recovery study, the SGOT level was decreased in comparison to control and vehicle control group. The values are still within normal range but considering histopathological study; it is suggest that drug may have potential to produce hepatic injury at very high dose on long time administration. The values of other biochemical parameters [Table 5] were still within the normal range even at higher dose of Metriviv syrup. There were no any drastic changes observed in the biochemical parameters in the test drug-treated groups. Hence, it may be suggested that the test drug do not seem to produce any serious toxic effect during repeated dose 28-day oral toxicity. The histopathological findings of the vital and reproductive organs at higher dose level of TEDx10 and in recovery study did not produce any changes in cytoarchitecture of brain, pituitary, liver, heart, thymus, spleen, kidney, lung, stomach, intestine, uterus, ovary, adrenal gland, trachea, lymph node and skin in comparison to control and vehicle control group. 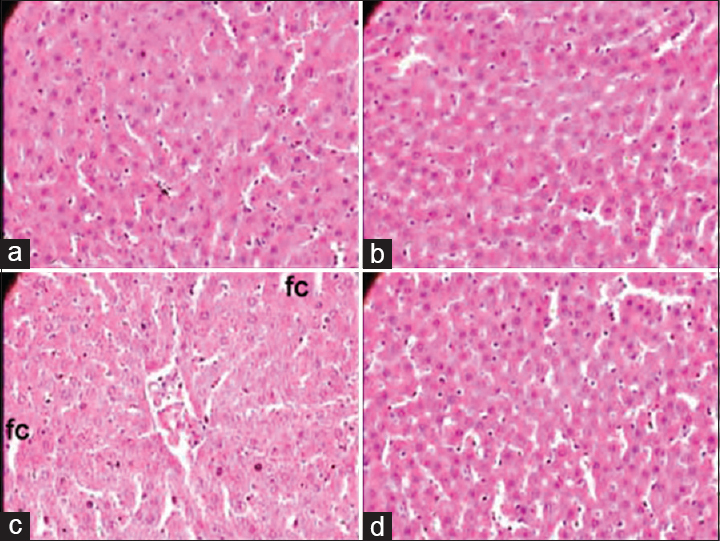 Effects of Metriviv at TEDx10 dose level produced micro fatty changes in the liver [Figure 1], the exact cause of micro fatty changes in liver is unknown, but many a time, it is also termed as nonalcoholic fatty liver disease which develops when there is too much fat in the liver or steatosis. The condition is also known as fatty liver. There may be no symptoms in the early stage but continue damage to the liver can lead to more severe condition. 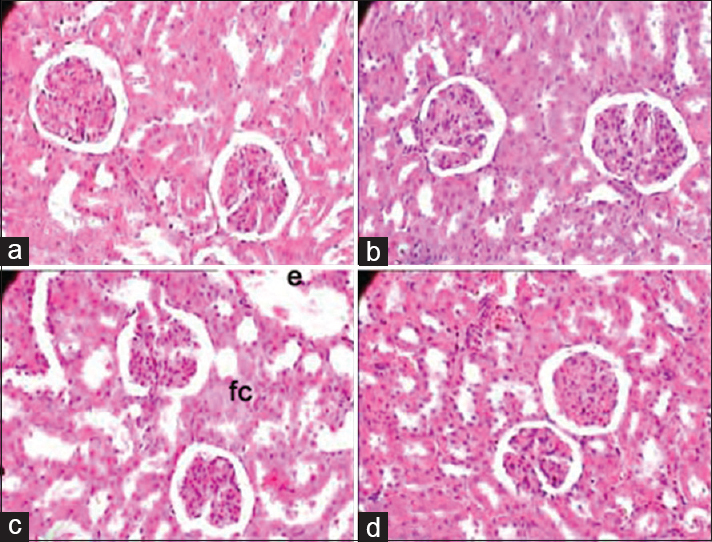 Fatty changes and edema in kidney [Figure 2], may be due to certain acute renal diseases or damage to the nephron or fluid retention. Epithelial erosion destruction in stomach [Figure 3], is different from an ulcer. The most of potential drugs on repeated administration has a side effect of hyper acidity, stomach injuries, etc. and mild-to-moderate stimulation in ovary. The changes were not observed in recovery group of animals and in the control group. The results suggest that drug has adverse effects on organs at TEDx10 dose level. The changes were reversed after discontinuation of the drug which may suggest that the adverse changes are reversible in nature at higher dose level after longer administration in rats. From the present study, it can be concluded that metriviv syrup did not produced any sign or symptoms of acute toxicity by oral route at single dose of 2000 mg/kg in rat and can be categorized as substances with low health hazard potential. The result of repeated dose 28-day oral toxicity concluded that, test drug at TEDx10, has only mild-to-moderate adverse potential for liver and kidney in rats while does not have any major toxic effects at therapeutic dose level in female albino rats. Morphy R, Kay C, Rankovic Z. From magic bullets to designed multiple ligands. Drug Discov Today 2004;9:641-51. Kroes R, Walker R. Safety issues of botanicals and botanical preparations in functional foods. Toxicology 2004;198:213-20. Paget GE, Barnes JM. Evaluation of drug activities. In: Laurence DR, Bacharach AL, editors. Pharmacometrics. Vol. 1. New York: Academic Press; 1964. p. 189. OECD425: Acute Oral Toxicity-Up-and-Down-Procedure. OECD Guideline for the Testing of Chemicals. Paris: OECD Publishing; 2008. OECD 407: Repeated dose 28-day Oral Toxicity Study in Rodents. OECD Guideline for the Testing of Chemicals. Paris: OECD Publishing; 2008. The Gazette of India: Extraordinary, Notification, 170, Guideline for Evaluation of Ayurveda, Siddha and Unani Drugs and other Traditional medicines of India. New Delhi: Department of AYUSH, Ministry of Health and Family Welfare, Government of India; 2008. Pennock CA, Murphy D, Sellers J, Longdon KJ. A comparison of autoanalyser methods for the estimation of glucose in blood. Clin Chim Acta 1973;48:193-201. Roeschlau P, Bernt E, Gruber W. Enzymatic determination of total cholesterol in serum. Z Klin Chem Klin Biochem 1974;12:226. Dominiczak M, McNamara J, Nauk M, Wiebe D, Wsarnick G, editors. Measurement of high-density-lipoprotein cholesterol. Handbook of Lipoprotein Testing. 2nd ed. Washington, DC: AACC Press; 2000. p. 819. Tiffany TO, Jansen JM, Burtis CA, Overton JB, Scott CD. Enzymatic kinetic rate and end-point analyses of substrate, by use of a geMSAEC fast analyzer. Clin Chem 1972;18:829-40. Bradley DW, Maynard JE, Emery G, Webster H. Transaminase activities in serum of long-term hemodialysis patients. Clin Chem 1972;18:1442. Wilkinson JH, Boutwell JH, Winsten S. Evaluation of a new system for the kinetic measurement of serum alkaline phosphatase. Clin Chem 1969;15:487-95. Tietz NW, editor. Text Book of Clinical Chemistry. Philadelphia, PA: W.B. Saunders; 1986. p. 579-82. Doumas BT, Arends RL, Pinto PC. Standard Methods of Clinical Chemistry. Vol. 7. Chicago: Academic Press; 1972. p. 175-89. Pearlman FC, Lee RT. Detection and measurement of total bilirubin in serum, with use of surfactants as solubilizing agents. Clin Chem 1974;20:447-53. Burtis CA, Ashwood ER. Tietz Textbook of Clinical Chemistry. 3rd ed. Philadelphia, PA: W.B. Saunders; 1999. p. 1136. Kabasakalian P, Kalliney S, Westcott A. Determination of uric acid in serum, with use of uricase and a tribromophenol-aminoantipyrine chromogen. Clin Chem 1973;19:522-4. Moorehead WR, Biggs HG. 2-amino-2-methyl-1-propanol as the alkalizing agent in an improved continuous-flow cresolphthalein complexone procedure for calcium in serum. Clin Chem 1974;20:1458-60. Lipnick RL, Cotruvo JA, Hill RN, Bruce RD, Stitzel KA, Walker AP, et al. Comparison of the up-and-down, conventional LD50, and fixed-dose acute toxicity procedures. Food Chem Toxicol 1995;33:223-31. UN Recommendations on the Transport of Dangerous Goods-Model Regulations, Part-2. In: Class 6 Toxic and Infectious Substances. 12th Revised ed., Ch. 2.6. Geneva: United Nations Publications; 2001. Gad SC. The rat pathology. In: Gad SC, Chengellis CP, editors. Animal Models in Toxicology. New York: CRC Press; 2007. p. 147-217.